A simple recipe with stunning result! These crab cakes with lemon mayonnaise are a match made in heaven. Lovely as a snack or as a starter/lunch! Drain the crab meat (frozen or from a can) well and dab it dry with kitchen paper. For the crab cakes, mix the mayonnaise, mustard and the egg with a whisk. Add the paprika powder, nutmeg, lemon juice and Worcestershire sauce and mix again. Add the crab and mix with your hands, without mashing the crab meat. Add the panko, parsley, chives and salt and pepper to taste. Mix again. If the mixture is a little too wet, mix some extra panko to create firm cakes. Cover the cakes and put them in the fridge for two hours. Make the lemon mayonnaise by mixing the mayonnaise with the juice and zest of the lemon. Season with salt and pepper. Heat a 2 centimeter layer of peanut oil in a frying pan on medium heat. Fry the cakes in 4-5 minutes on both sides until the cakes are beautiful golden brown. 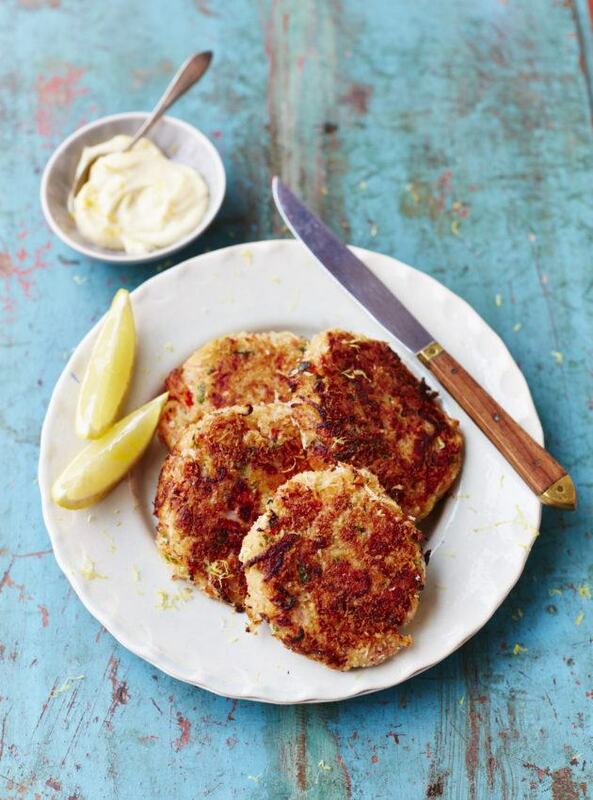 Serve the crab cakes with the lemon mayonaise and lemon parts. Enjoy!